FARM FRESH VEGGIES!! Does anyone else get as excited as a three year old at 6 AM on Christmas morning when they see this hand painted sign pop up on the Main Road in Laurel?? I hope I'm not the only one!! And if you have no idea what I'm talking about, please keep reading. I think you'll thank me at the end and will be saying to yourself, "I need to forkin' go there!!" Wowak Farms is the site of that infamous sign mentioned above. Although now they have changed it to "Wowak Farms Home Grown Vegetables" as of last year. Located at 2805 Main Road in Laurel, NY, it is hands down my favorite farmstand on the North Fork of Long Island. Starting in the spring when I see the asparagus vertically lined up on the farmstand counter and that hand painted sign appears, my yearly northforkin' produce adventure begins. 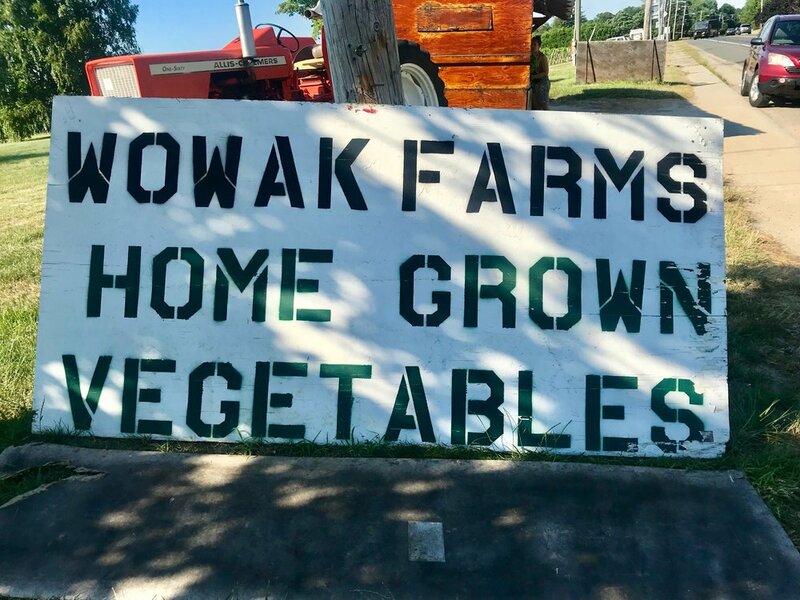 Wowak Farms was started by Tom Wowak in the 1970's. He had learned how to farm from his father, who lived in Jamesport after coming to the United States from Poland, where he farmed as well. Tom was born in the United States, and after he decided to start his own farm, his father would help him out as much as possible driving the tractor. At first, Tom only grew potatoes, and for years the potatoes were sold mostly wholesale. But some 50 pound bags would be placed outside of the house for sale with just a jar outside the door to collect the money. The epitome of small town farm living!! But after many years of potato farming, soon there was little to no money to be made with only growing potatoes, and the changing economy about 15 years ago forced a shift. Tom asked his daughter Valerie if she wanted to open a farmstand with him, and because she had grown up working with him on the farm, it was only natural for her to say yes. And now as Tom is looking at retirement, the family tradition can continue with Valerie and her husband Kevin fully taking over the farmstand. For me, as someone who also works with their father (and grew up working with him as well!) and also plans on taking over the family business, this northforkin' family farmstand story is even more special to me. Let me first get out of the way that Wowak farms is strictly a FARMSTAND. No frills. No extra distractions. No hay rides, no corn mazes, no winery, no singing, no tshirts for sale, no face painting, no all you can pick, no petting zoo, no death defying circus acts (just kidding on that last one...but now I probably gave someone their next big idea). It's just amazing, fresh, locally grown produce at reasonable prices, and that's all I need. So back to that Christmas-like excitement I feel when the farmstand finally opens for the season. My favorite soup growing up was (and still is) roasted asparagus soup with a hint of tarragon. And after years and years of eating it, I can say that my favorite asparagus is found at this farmstand. Now, I have tried asparagus from other places in times of "dire need" when I have a particular craving for this soup. Sometimes I would "have to" purchase from the grocery store when it was locally out of season...letdown. And sometimes thinking about asparagus soup all day at work and then driving by the farmstand after I'm done and they are sold out and I have to get it somewhere else...another forkin' disappointment. Edible yes, good yes, but not Whoa-wak good. 1. Cook bacon in a large saucepan over medium heat 6 minutes until crisp. Remove bacon from pan with a slotted spoon, reserving drippings. 2. Add shallots and thyme to drippings in pan; sauté 2 minutes. Add garlic; sauté until fragrant. Sprinkle flour over mixture and cook for 1 minute stirring constantly. 3. Stir in milk, chicken stock and bay leaves and bring to a boil. Reduce heat to medium; cook 2 minutes. Stir in salt, black pepper and shrimp; simmer 4 minutes or until shrimp are done. Add in corn and discard bay leaves. 4. Serve sprinkled with bacon and green onion for garnish. Ok. Let's get back to forkin' business. Another favorite of mine from Wowak Farms is their yellow cherry tomatoes. They are INSANELY delicious. A friend of mine nicknamed these little yellow morsels "Pop 'Ems", because you can't help but keep popping these addictive little bites into your mouth. I'll stop by the farmstand just for a couple of pints of them, and three pints later, I'm back at the farm stand the next day. No dressing or dip needed. Beyond the asparagus, corn and tomatoes I've highlighted, there are so many other delicious finds here. Spinach and other lettuces, beets, radishes, zucchini, yellow squash (summer squash corn chowder!! ), cantaloupe, watermelon, butternut squash, broccoli, cauliflower, string beans, peas...the list goes on and on. My Dad gets like a little kid on Christmas morning when the lima beans are revealed in the late summer. And I actually tried them last year after hating them for about 35 years, and I think I'm starting to take a liking to them!! I'm actually looking forward to another test run this year. So stay tuned. So for those of you that are fans of Wowak Farms already, the next time you are there, think of me and maybe try something new. And take a picture to share your northforkin' food adventure!! And for those of you who haven't been to Wowak Farms yet, I urge you to visit! 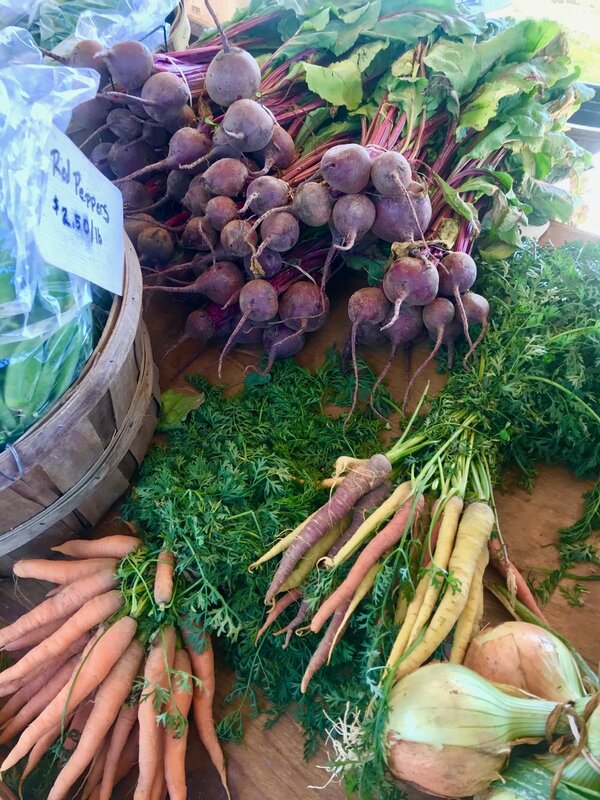 Get your favorite farm fresh veggies and maybe something new as well or something that you've tried before but haven't liked in the past. You may be surprised! Make your own home farm to (vege)table.